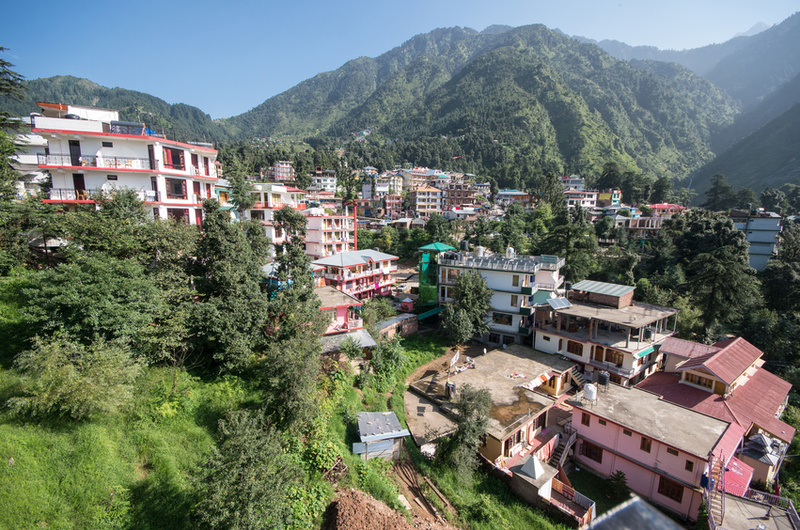 Now at about 8000 feet up in the Himalayas near Mcleod Ganj just outside of town at guest house; we will stay here 2 nights and then move further up into the Himalayas. Very very humbling to be back in the shadow of the WORLD’S GREATEST mountains, no apologies given to the Andes in this regards, as the Himalayas are in THEIR OWN CLASS and everyone should see them at least once in their life. 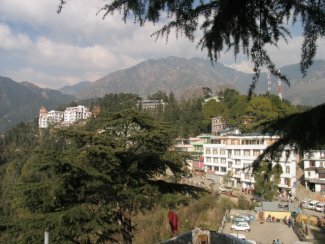 These 5 and 6 thousand meter mountains tower above this small town perched right on the edge of the pine covered hills forest. You have to arch your neck back to look up at them and they dominate the back drop of this town. I am going to do a 1 or 2 day trek from Dharkamot to about 11,000 feet only, (No worries about altitude this time as I won’t be going above 11k!! haha!) but from there you have spectacular views of the high mountains and the sky is blue here unlike the rest of the flatlands we have thus far seen in India. Many Tibetan monks here. Massage places also so we will try one on the return. About 2km from where we are staying is the residence of the Dali Lama. He is here now as he just wrapped up a week of free speeches to the public around the 1st of the year. 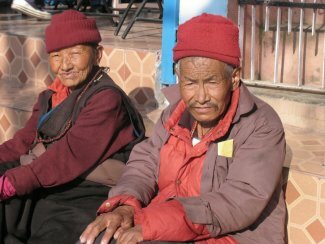 He came here in 1959 with followers and this area has turned into a HUGE mecca for the “free Tibet” movement and thousands of Tibetans live here. They are a very attractive people. There are bookstores galore and many Tibet shops. We will visit the holy residence tomorrow I think, as we can walk there from the main part of town. It is VERY cold here now and I have 6 layers on, pretty much everything I brought, which by the way is holding up quite well, as all I brought was a small school size backpack. The uppers and lowers fleece and the very compressible down jacket does wonders to fight the cold. It has been getting down to the teens at night near here and only in the 40’s during the day. our hotel does not have heating, but we have big blankets. In just a week we will be in the hot weather of the Philippines, so looking forward to that warm experience. Haha! Macleod Ganj does not feel like India, but rather more like Tibet. It’s hard to believe we are even in India and the polluted plains and crowds of the India flatlands seem light years away. We visited the Holy Residence of his Holiness, the Dali Lama – unfortunately we just missed his free talks the week before but we saw the main temple and all the main residences. It feels like a college campus except there are many Tibetan monks walking around. 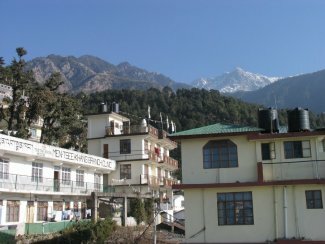 There are excellent views overlooking the high Himalayas from the courtyards. Also a very good museum about their trek into this part of India in 1959 and about the Tibetan people and their struggle for freedom. We just got back from a 20 click trek and were hiking literally all day in the mountains. We went straight up a very rough trail and then straight back down. I ventured on this hike in merely my flip flops! Quite a challenge and lucky I didn’t sprain or break an ankle on the dangerous rocks. Broken ankle I suffered on top of Huyana Picchu in flip flops above Machu Picchu brought back memories, so I was very careful. 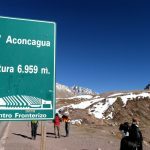 Incredible jagged snow and rock covered mountains towered high above the trail – huge giant hillsides rose high above us with these 4000, 5000 and 6000 meter peaks rising even higher above the foothills. In reality all of these heights are merely the foothills for the highest of the Himalayan peaks which tower well above 7000 and 8,000 meters. The Himalayas are just so massive. 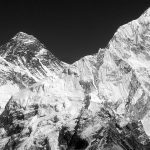 There are no 7000 meter peaks in the world outside of the Himalayas. We hiked up to just above 11,000 fee which was the start of the snow line. 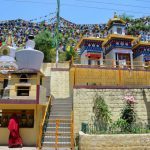 I was getting quite dizzy and took it easy – we hiked above the small huts and I found hundreds of prayer flags flying between the trees in the wind. Dark clouds were coming in and finally obscured our vision of the mountains. It was DAMN cold – definitely below freezing as the water was still frozen everywhere and the snow drifts not melted at all. Apparently last year at this time there was several feet of snow covering this area and you could not trek here unless you had snow shoes. We spent an hour up here huddled in a tent finishing up our lunch and then hiked back very slowly down the mountain enjoying the views. Neat to walk among the small villages – many monkeys and mating dogs in between the villages. Also the Tibetan men like to sing when they are walking and not uncommon to find 4-6 guys all singing in harmony on the trails. 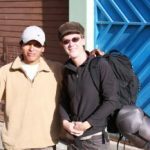 I went up to the Himalayan Mountain Institute and talked to the guys; they offer treks and climbs during the climbing season. 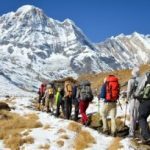 From the photos, they offer some fantastic treks. We have met many travelers from around the world – most doing a minimum of 3-4 months with surprisingly enough of them traveling for 8-12 months. No one we have found is traveling for short periods. We all agree work is over-rated. I bought a beautiful hand made Tibetan prayer bowl which is made of 7 metals. 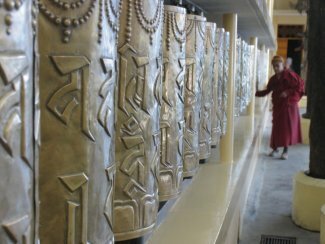 You run the prayer wheel around the edge and it makes a deep sound. Put some water in the bowl and it makes a different sound and the water vibrates into the air like a geyser.